Have you ever heard a New Yorker say New York City bagels are the best? If you don’t live in or near the city, then maybe you’ve simply brushed off this claim. But, if you’ve ever tried a NYC bagel, then you understand. What makes NYC bagels so great? Classic NYC bagels are fresh out of the oven and require certain preparation and ingredients. Bakers use high-gluten flour, water, yeast, salt and barely malt. The malt creates the smooth sweetness that gives NYC bagels their infamous great taste. NYC bagels are typically shaped by hand. Once shaped, the dough is left for about 12 hours so it can rise. They are then boiled in water, pressed and baked. 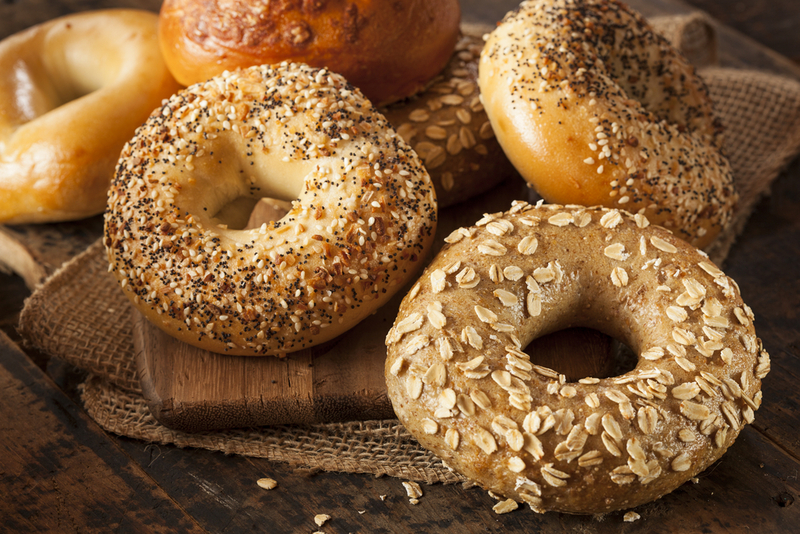 When bagels first took over the city, there were four main flavors: plain, sesame, poppy and salt. Today, you can find all sorts of flavors in NYC bagel shops, including garlic, onion, chocolate chip, wheat, everything and cinnamon raisin. The NYC bagel tradition stems back to Poland in the 1700s. Eastern Europeans started immigrating to NYC in the 1880s, and brought with them their bagel craft. Today, amongst all the authentic NYC bagel shops, you may also find chain bagel stores that mass produce bagels, without putting added time or effort into the bagel making process. To help you differentiate the good from the bad, here is a list of the top bagel shops in NYC from Hussain al Nowais, a retired Manhattan chef and restaurant owner. At these bagel shops, you’ll get a taste of old-world New York and understand why NYC bagels are simply the best in the world. Absolute Bagels – Situated at 2788 Broadway on the Upper West Side, this bagel shop usually has a line out the door. Here the bagels are always coming fresh out of the oven, and you’re likely to get one when it’s still piping hot. When bagels were first introduced to NYC they were 3 ounces instead of 7. At this bagel shop you can get the traditional 3-ounce bagel. Barney Greengrass – Since its humble beginnings in 1908, this bagel shop has served up some of the best bagels in the city. Located at 541 Amsterdam Avenue on the Upper West, this shop is famous for its Jewish specialties. Try a bagel topped with Nova Scotia salmon or chopping herring salad. Russ and Daughter’s – This shop is a must-visit foodie destination, located at 179 E Houston Street on the Lower East Side. The shop is famous for its Jewish delicacies, which it has been serving up since 1914. This shop gets their bagels fresh from Bagel Hole in Brooklyn and finishes them off with their signature Nova lox and Ben’s Cream Cheese. What’s your favorite bagel shop in NYC?